Have you ever eaten roasted radishes? If not, what are you waiting for! 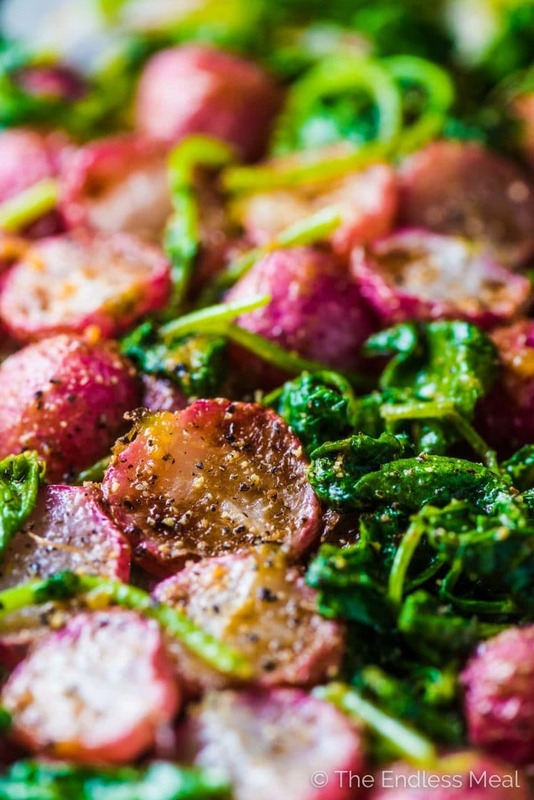 They're a super easy side dish with big-time pretty factor. And, especially when they're coated in salty miso butter, so delicious. 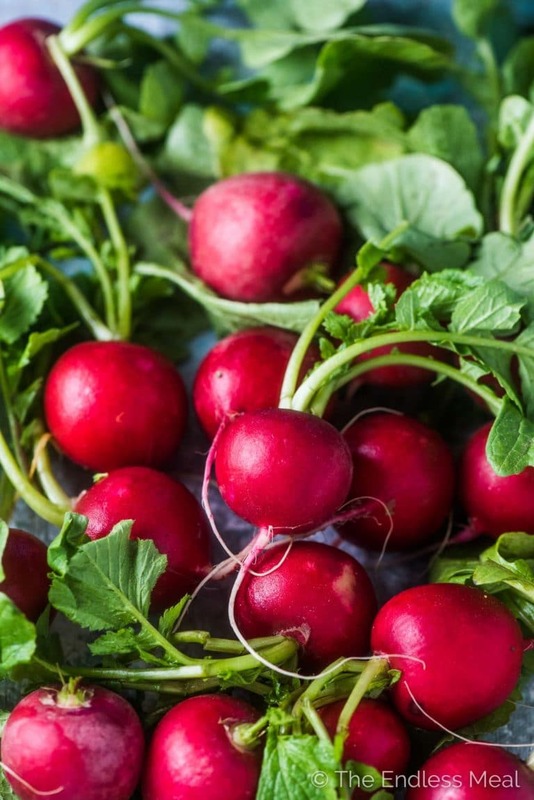 Even though radishes are seasonally a spring vegetable, they're readily available year round. But if you're making this out of season the radish greens might not be fresh enough to use. That's ok! Spinach works just as well. 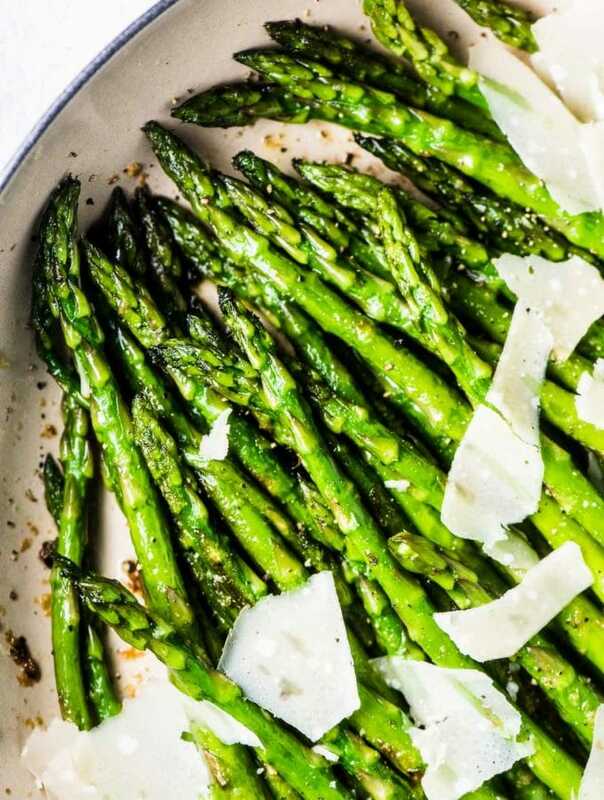 They're a super quick and easy to make vegetable side dish recipe. The light pink color is so pretty! 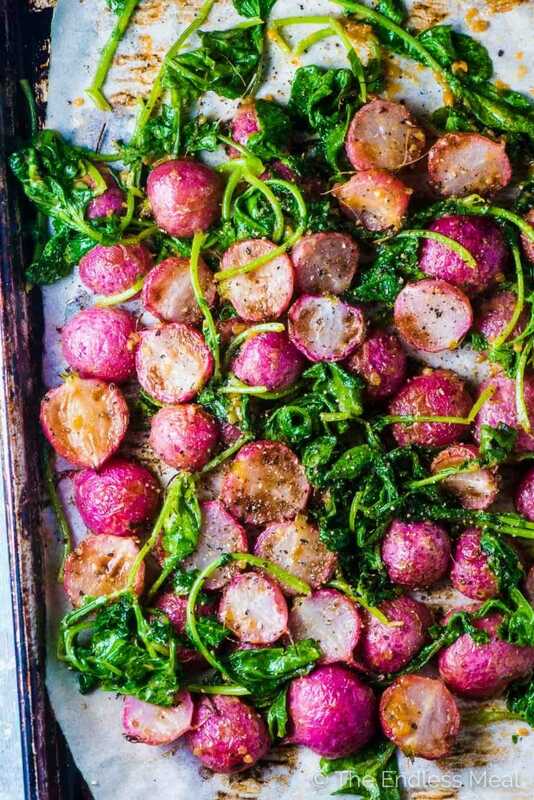 Baked radishes lose their spicy bite so this is a recipe you can serve to even the most sensitive eaters. Even though they're deliciously buttery, this is a low-cal and low-carb recipe. Smothered in miso butter. Miso + butter = magic. 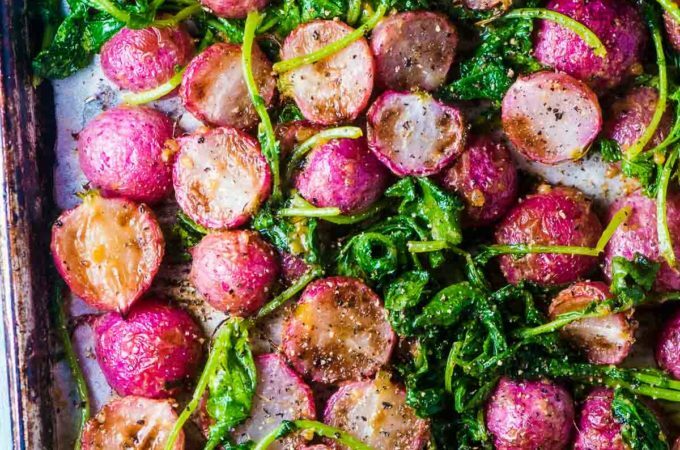 Roasted radishes are super easy to make. Lay them cut side down on a pan and pop them into the oven. I like to cut them in half so their cut sides get a little browned. It also means they cook in only 15 minutes. Often, I'll pop some chicken breasts into the oven about 5 minutes before the radishes then pull everything out at the same time. 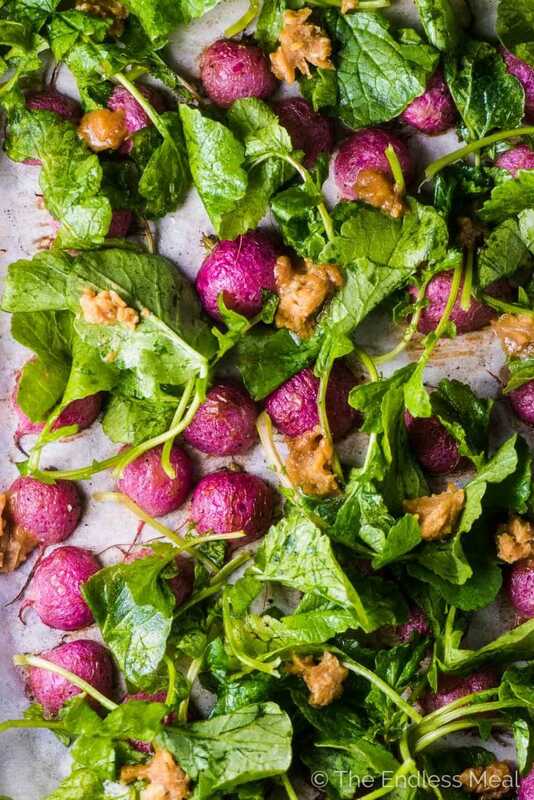 When making this miso butter roasted radishes recipe, I dot the miso butter over the mostly cooked radishes (like in the picture below) so that it melts after a few minutes in the oven. Once it's melted, you can easily toss the radishes so they're coated in the butter. If eating gluten-free is important to you, make sure you read the label on the miso to make 100% sure the one you're buying is gluten-free. Most are not. But white miso, which is made with fermented soybeans and rice, is generally gluten-free. This Hikari miso (found on Amazon) is gluten-free and can be used in this recipe. What kind of miso makes the best miso butter? The three most common types of miso are white miso, yellow miso, and red miso. White is the mildest flavored, red in the strongest, and yellow somewhere in between. While I personally love the strong, pungent flavor of red miso, if you're new to cooking with miso, white or yellow is probably your best bet. They are more versatile and can be used in most recipes. While I know there will be a few miso nazis out there who will be up in arms about what I'm going to say, but I'll say it anyway. I think you can use any kind of miso in any recipe. I've tried them all and used them randomly in many recipes and they're always delicious. Such a great idea to cook radishes. I never would have thought to do that. The miso butter took them over the top. I’m happy to hear you liked the recipe! Have you tried my Sweet Sauteed Radishes? They’re great, too! My family love this dish! Great new way to eat radish, I dotted some homemade horseradish butter over mine! Yummy! 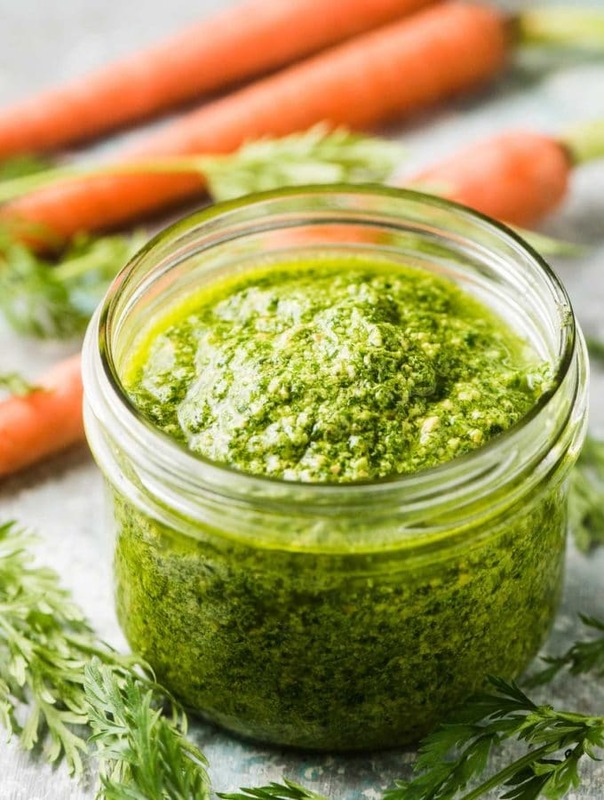 Homemade horseradish butter sounds incredible!!! What does a pkg of miso look like & can you buy it in a regular grocery store like Publix? If so where would I look? Thank you. Excited to try these! We don’t eat dairy, though. Do you think ghee would work here? I think ghee would work well! I have never thought about roasting radishes. 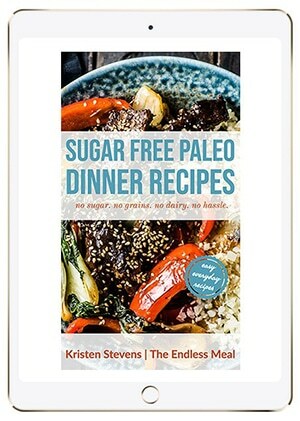 But you have convinced me through your recipe and photos. They look fabulous. I love raw radishes, so I can only imagine how amazing these are. Such a GREAT recipe. Thanks so much for sharing Kristen. You are so welcome! I love radishes, too. I put some in my dinner salad almost every night. This is a nice way to switch things up! These look SO outstanding. Radishes need to go on everyone’s menu more often. With a recipe like this, it’s going to happen for sure. I so agree! Radishes are one of my spring veggie favorites!